Arthritic knees are one of the most common effects of arthritis, quickly becoming inflamed, swollen, painful, and stiff. Arthritic knees can be treated using various knee exercise equipment either at the gymnasium or at home. Regardless of the location, exercising equipment should only be used on the advice of a professional physiotherapist who has experience in working on patients with arthritic joints. This is an article on Arthritis, Joint & Rheumatic Conditions and in particular the best exercise equipment for arthritic knees. We begin with an overview of the arthritic knee, and the exercises to be avoided in order not to exacerbate the condition. The knee is a normally stable hinge-type joint, formed where the femur and tibia bones meet and being covered with the patella (kneecap), all held together and securely in place by four major ligaments. The ends of the femur and tibia bones as well as the inside surface of the patella are covered with articular cartilage that allows the normal joint to operate smoothly and frictionless with the minimum of effort. However, arthritis eats away at this cartilage allowing the two bones and patella to contact each other and this is when one hears a grinding noise whilst moving the knee back and forth. This cartilage loss also causes the swelling and inflammation around a usually hot arthritic knee joint. The purpose of exercising the arthritic knee joint is to reduce swelling, increase range of movement, and flexibility, promoting knee stability whilst reducing pain. The best equipment for exercising arthritic knees should produce a smooth motion of the knee with minimal bending. This will promote the strengthening of quadriceps, stabilizing the knee without any impact to the joint. It is important that medical advice and instruction is sought before purchasing or using any exercise equipment. This is one of the best examples of equipment for arthritic knees; the hot water supporting the weight of the body and allowing the exercise of the knee underwater with less pain. This equipment is used to build up the quadriceps, a very important set of muscles that support the kneecap and control the knee joint. 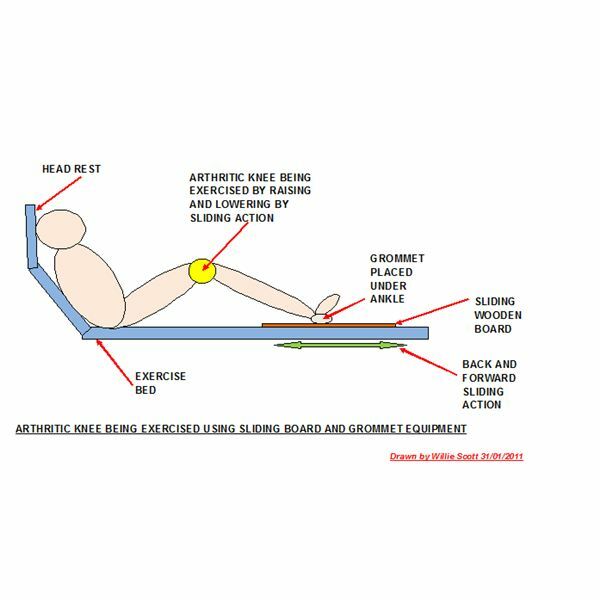 The exercises are carried out whilst lying on one's back and sliding the foot back and forth on the board, the heel being supported by a cloth grommet. 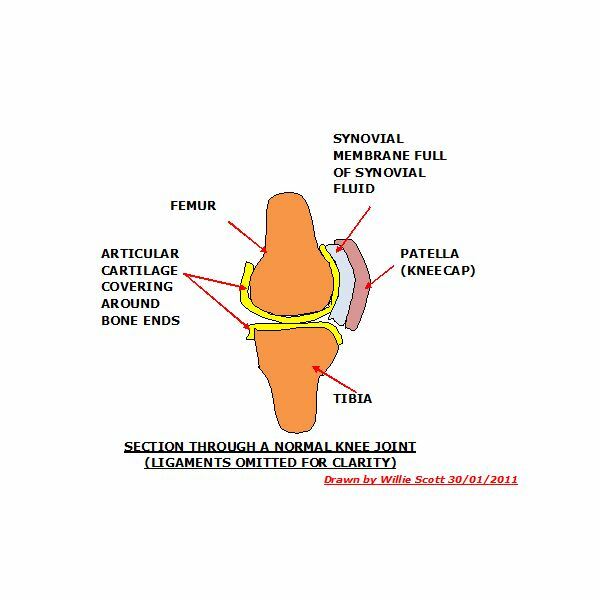 This action causes the knee to rise and fall, controlled by the quad muscles as shown below. 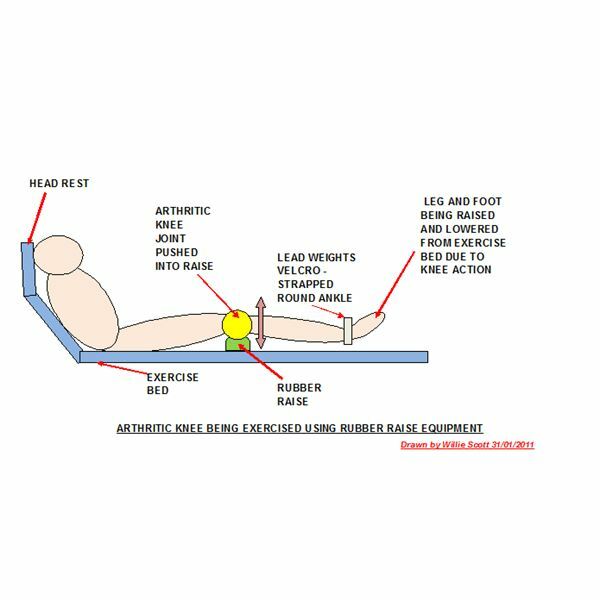 This is a semicircular hard molded rubber raise being put under the knee joint whilst lying on a flat surface. Pressing down on the raise with the underside of the knee causes the foot to lift off the surface thus strengthening the quadriceps, as shown below. These are lead weights contained in a cloth bag which are strapped to one’s ankle whilst carrying out exercises on the rubber raise. This increases the effort to lift the foot off the surface, more weights being added when the knee joint is stronger. These come in different resistances and are color coded to identify the strengths of the bands. The bands are cut to length and placed under the foot, being held by both hands tightly. The knee is then bent and straightened, strengthening the knee joint. This exercise equipment is also known as a recumbent bike, and incorporates an adjustable friction brake. 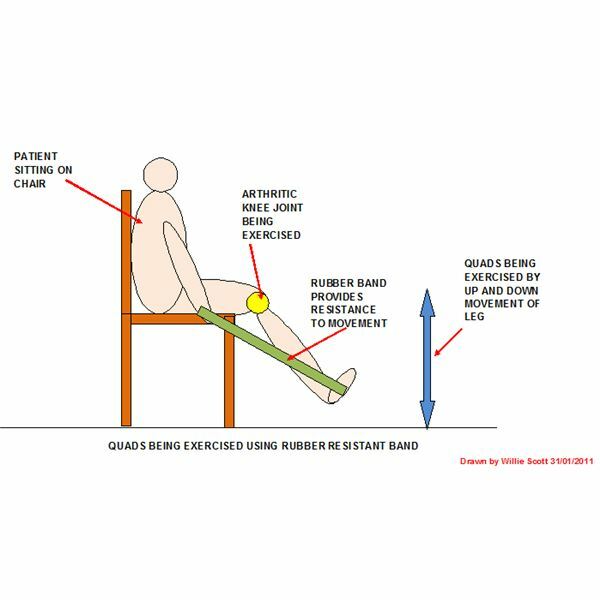 This allows the patient to vary the load being applied through the knee joint, the resistance can be increased as the knee joints become stronger. This is also a good inexpensive example of the best exercise equipment for arthritic knees. It consists of two pedals incorporated in a sturdy frame that is located on the floor in front of the patient. The patient sits on a chair, and after inserting the feet in the pedal stirrups commences to rotate the pedals, the exerciser again having an adjustable friction brake. This equipment is small, compact, and easily stored compared to an exercise bicycle. This equipment is normally used as a measure for overall fitness, rather than equipment for exercising arthritic knees. When the author tried out this equipment, it not only exercised the arthritic knees but also as a bonus strengthened the shoulder joints, that are scheduled to be replaced by surgery this year. One word of caution – it is easy to overdo the exercise; start with a 5 minute session, progressing to a maximum of 15 minutes a day, and even then only doing lower body exercises for the first three months or so. Before any knee exercises are carried out, it is advisable to apply ice packs for twenty minutes. Ice packs should not come in contact with bare skin; a wet cloth being placed between the ice pack and knee joint skin area. It is also advisable to elevate the legs above the level of one’s heart in order to promote the circulation of blood and drainage of fluid, whilst ice packs are being applied to the knee joints. For further information on knee exercises please click on this Bright Hub link.